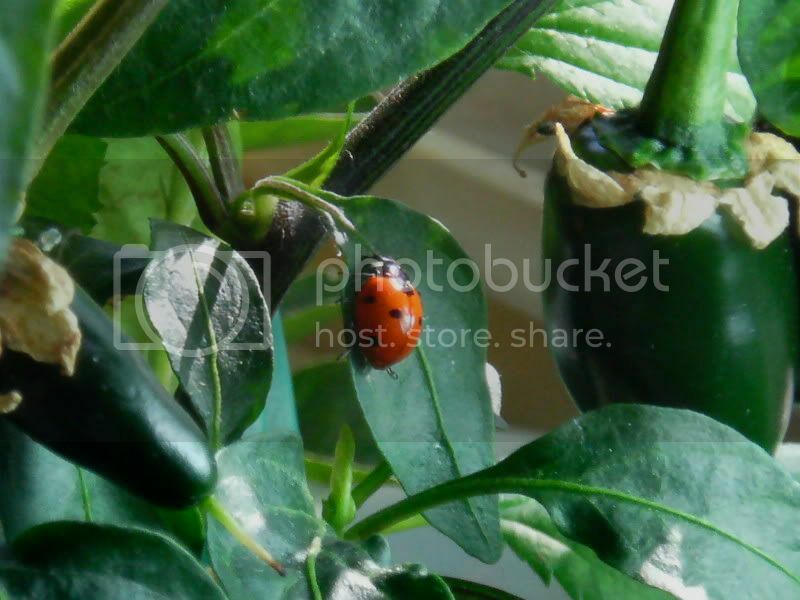 Found a Ladybug to patrol indoor plants for aphids! Yesterday was such a warm day -- nearly 80Ã‚ÂºF in the sunshine, 68Ã‚Âº in shade. Look at the color on this bug! When I caught it, the spots were barely discernible. I'd say it's been feasting. Is that the native kind or the imported kind? I'm not great with visual stuff. FYI, at the end of the season they bite. I don't know why but it is annoying. Nice! I came across one yesterday too, I was happy myself. I should have brought it in for the fungus gnats they do eat those don't they? Actully the gnats were pretty much gone than I brought in my big tomato that has been outside when a stampede of gnats started going everywhere. Needles to say "el tomato went back outside. I don't believe they prey on gnats. Nope. Just aphids. Get spiders for the flying gnats, HG said predatory nematodes eat the maggots in the soil. I think my baby centipedes are eating them too. You gotta love all the critters of the soil food web. It seems now every time I go planting I find something wriggling around. I saw something yesterday not sure what it was a VERY tiny worm like creature i thought about taking a pic but it disapeared. It is amazing to see that they made it through the winter. There are no dead ladybugs on the floor and the cluster has totally disappeared. All winter they just sat there, no food, no water, not moving and then come spring (how did they know!? in a dark corner in temperature regulated house) they woke up and dispersed themselves! i found ladybug larva in my garden today!